When you are paid once a month, it can make budgeting both much easier and much more difficult. When you are paid once a month, you can set up all your bills to be taken out right after you get paid. That way, you won't have to set aside money from each paycheck to cover your rent or mortgage, student loan payments, or other bills. In that way, it makes paying your bills a lot easier. However, it can be more difficult because when you are paid once a month, it is easy to go through all of your other money quickly and leave you falling short at the end of each month. In this way, you'll need to be much more disciplined with how you spend your money. Read on for tips on how to budget successfully when you get paid once a month. If you are paid once a month, one option is to set up your bills to all come out as soon as you get paid. Most companies will allow you to set up direct debit to pay your bills. It is easier to do this just once a month, and it saves you time since you are doing everything all together. For example, if you are paid on the first of every month, you can set up your cell phone or cable bill to come out at the beginning of the month. If you have other bills automatically deducted from your checking account, such as your mortgage payment, you can also set this to come out the day after you get paid. This will simplify the entire process. However, it may be a bit more complicated with bills that aren't a set amount, such as utility bills. Be sure to allow for fluctuations in these bills if you choose to set up direct debit. And if your bills are due at all different times of the month? Most companies are willing to work with you to change the due date, especially if you are setting up direct debit. Simply call and ask to get your monthly due date changed. Keep in mind that after you pay all your bills, you should also be setting aside money each month into savings. This will help you stop living from paycheck to paycheck. Switch the remaining categories in your budget to the envelope system or to a cash-only basis. This means that you will not use your debit card at all, but will only use the cash for each category to make your purchases. Withdraw the money from your bank at the beginning of the month and then put the correct amount into each category. This will stop you from blowing all of your money on eating out the first week since the categories are divided up already and you know it's time to stop spending in one category when you run out of money. Switching to cash is a great option if you hate tracking your spending. It simplifies the process and protects you against scenarios like money you need to spend on groceries was spent on a night out with friends. If you find that you spend most of your grocery money at the beginning of the month or if you have a difficult time with other categories such as entertainment, you may want to split up these into smaller weekly amounts. Set a limit for each week, and only take that amount with you when you go shopping. You can also make weekly envelopes for each category. This is the best way to stop overspending and stay on track throughout the month. The key to making it to the end of each month is to stick to your weekly limits for each category and to not overspend in any category. As you switch to cash for your entertainment, groceries, and clothing money, you will soon learn to stop overspending. It is important to stop spending once you run out of money. If you don't, that's how you run up credit card debt. While a cash-only budget can help with this, setting weekly limits can help as well. It is important to make sure that you don't forget common budget categories. You can also look for new ways to save each month to help you stick to your spending limits. 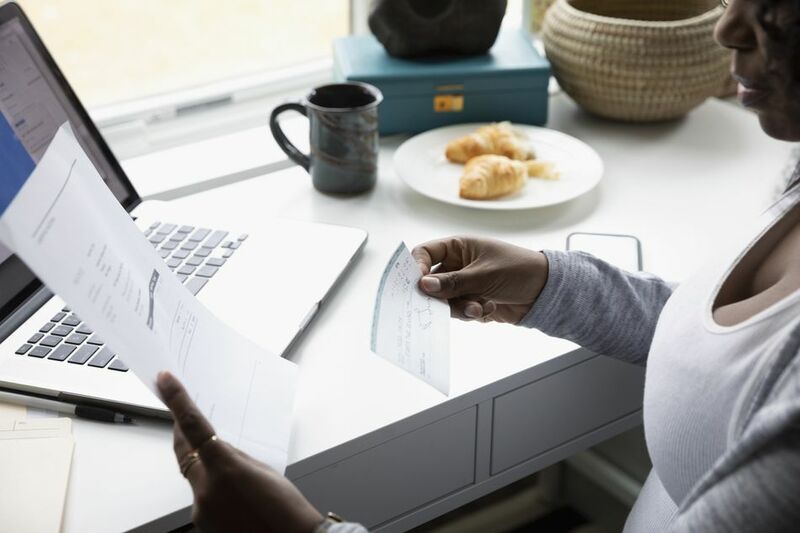 When you are paid once a month, the month can feel long, especially if you run into unexpected expenses like car repairs and other issues. An emergency fund can help you handle those expenses without ruining your budget. When you only get paid once a month, it is even more important to have an emergency fund because an emergency can eat up all of your money at beginning of the month and leave you struggling for the rest of it. Setting aside $50 a week for an emergency fund will give you a good start. You can also apply bonuses or tax refunds to build one up.